Denver’s River North neighborhood is a gritty mix of street art, galleries, craft brewers, tech startups, creative agencies and tight parking. It’s where you can get a craft cider, a Ducati superbike and commission a dining room table all in the same block. And now, it’s where America’s struggling health care system may be saved. The view of the Denver skyline is unobstructed from the seventh-floor amenity deck. 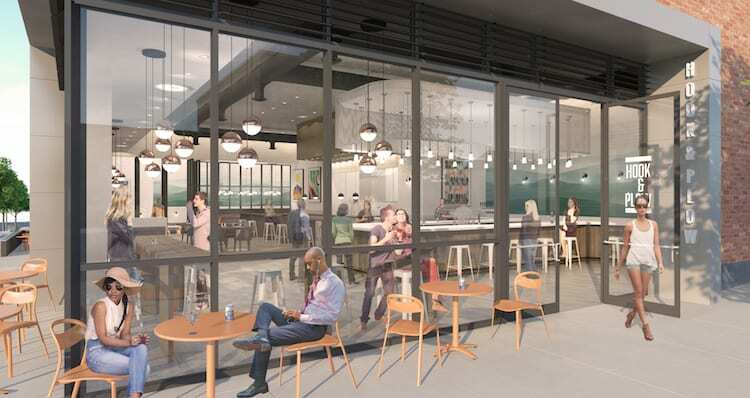 Located at 35th and Brighton Boulevard, Catalyst HTI will house a diverse and complementary mix of startups, Fortune 500 health care companies, law firms, tech companies, restaurants, bars, financial services, event centers, fitness areas and, even a primary care facility. 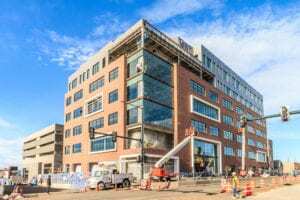 The seven-story, 190,000-square-foot structure is slated to open in the second quarter and an additional 190,000-square-foot building will join it in Phase 2, slated to break ground soon. 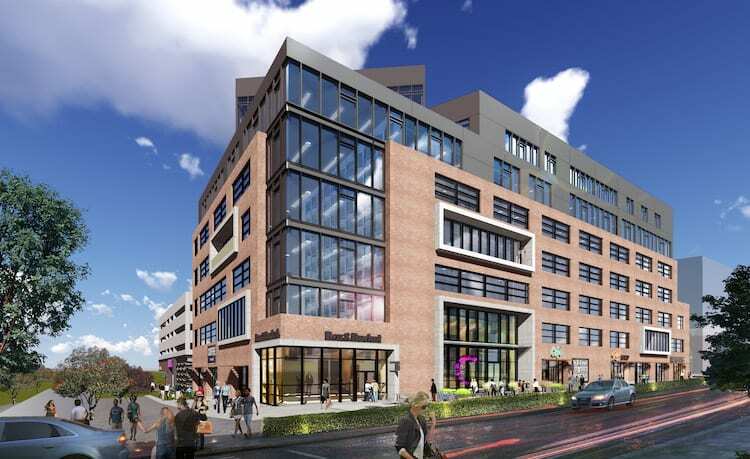 In 2011, longtime Denver developer Koelbel and Co. was a key player in creating INDUSTRY, a co-office space that opened at down the street at 3001 Brighton Blvd. In the process, Dean Koelbel met Biselli and Larry Burgess, who had been buying property along Brighton Boulevard since 1968 in hopes that someday in the future his investments would pay off. The three hit it off and not long after, Biselli approached Koelbel with a grand idea. Catalyst proudly anchors the corner of 35th Street and Brighton Boulevard. Koelbel and Co. folks loved the idea; they just needed a place to put this industry integrator. Luckily, they knew just the guy. Enter Larry Burgess, who had developers calling him on a daily basis to get their hands some/any/all of his properties. But Burgess had more than real estate profits in mind. “Larry didn’t just want to sell his land, he wanted to be a part of something,” says Koelbel. So, Biselli and Koelbel pitched the idea of Catalyst to Burgess, whose wife had, coincidentally, just retired from Kaiser Permanente after 36 years. With some spousal insight into how dire the situation was in America’s health care system, Burgess saw the chance to make a difference. He came in with his land as equity, Koelbel and Co. was on board as developer and Biselli was the visionary. Ground was broken in late October 2016 and Catalyst was on its way. With the need, the vision, the players, the land and a passionate community all in place, the next step for Koelbel and Co. was unique. The corner of 35th Street and Brighton Boulevard is activated through ground-floor restaurant/retail space. Denver design-build firm The Beck Group, which previously had teamed with Koelbel and Co. on University Station, was called in to bring the vision to life. “This is really the reimagining of a collaborative office space that provides a platform for the health tech industry to work comfortably in that venue,” says David Morris, design director and principal of The Beck Group. According to Morris, Beck originally was tasked with the design and construction of the core and shell, but their responsibilities grew as the project unfolded. Burgess, Koelbel, Biselli and The Beck Group collaborated extensively over the next few months and devised the look and feel of what Catalyst would become. According to Morris, they wanted a building that would stand the test of time, fit seamlessly into the RiNo landscape and supports what they call “serendipitous collisions,” those moments when people who office in Catalyst HTI have impromptu meetings where an exchange of ideas can happen. Koelbel says that creating a monument staircase not only addressed the chances of those serendipitous collisions but it helped the building in another way. The skin of the building is primarily tumbled brick, glass and metal panels with striking, over scaled portals that provide balcony space for tenants to soak up some impressive views of the Mile High skyline. Those surveyed prior to design said they wanted industrial chic and that is certainly what The Beck Group has delivered. When you enter the lobby of Catalyst, you’re immediately struck by the openness of the vast, four-story atrium space bathed in natural light. By design, the lobby will also be home to restaurants and a prominent coffee shop. The four-story grand staircase provides for impromptu collaboration throughout the Catalyst ecosystem. And one of the biggest features is, indeed, the grand wood and steel open-tread staircase. Other interior features include a shared executive boardroom and “living room” on the seventh floor, as wells as a shared kitchen on the fourth floor. An attached building next door houses parking and event center. 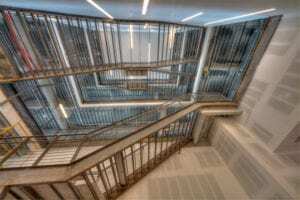 Of the building’s 25,000-square-foot floor plate, only 12,000 sf is rentable space and the rest is common areas so the feeling throughout will be very open and airy. 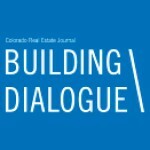 All 63 suites are sold out, as well as the 30 desks and as of this writing, a total of 78 companies have committed to Catalyst, including major players like Kaiser Permanente, which will have a primary care facility, Prime Health, CirrusMD, American Diabetes Association, Egg Strategy, Terumo BCT and the University of Colorado Anschutz Medical Campus. Catalyst HTI seems to be exactly what its founding partners envisioned. It’s industrial chic look bridges RiNo’s industrial past with its tech future and it has already attracted the mix of tenants needed to make the health care innovation ecosystem thrive and succeed. What Biselli, Burgess and Koelbel envision is a moon shot of sorts. But, it’s one we have to try. And according to Biselli, it really must work.